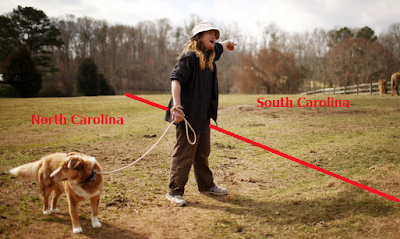 cryptonaut-in-exile: #NC / #SC border not yet settled? A couple of hundred years ago, intrepid surveyors carved out a line between North Carolina and South Carolina and marked their work with notches on trees and, later, the occasional rock. The federal government eventually approved the boundary and life went on. But trees fell. The rare stone marker was lost. Land was bought and sold and guesses were made. Bit by bit, the border shifted a little bit north. Borders have consequences: dog and owner now have different state residency.